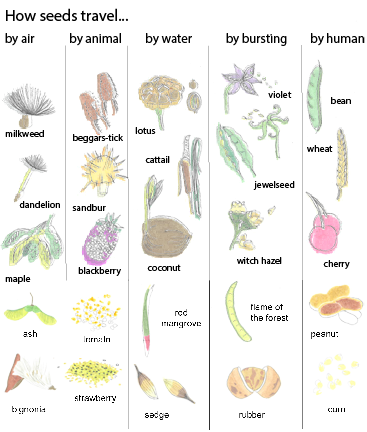 Seeds keep the life cycle of plants going. Plants produce seeds, reproduce more seeds, grow into new plants, and die. The cycle goes on and on. There are a million different types of seeds. Seeds vary in shape, color, and size. Some seeds like wheat, corn and rice seeds grow cereal and flour producing plants. Apples, avocados, and peaches are fruit seeds. Flowers are grown from seeds. Peas, tomatoes, peppers and cucumbers start from seeds. You can grow grass and herbs from seeds. Some seeds like peanuts, flaxseed and sesame seeds are edible. Yum! Other seeds like garbanzo beans and lentils need to be cooked before eating. 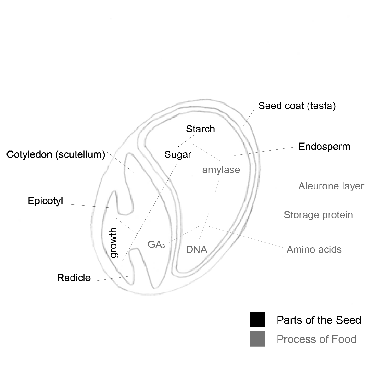 For protection, seeds have a seed coat on the exterior for protection so that the embryo, a tiny plant, and the endosperm, small leaves that provide the embryo food, don’t dry out or get damaged. Some seed coats are hard like corn and sunflower seeds. Other seeds have soft seed coats like marigolds, tomatoes, zinnias, peppers, and cucumbers. All seeds need the right combination of water, oxygen, and the right temperature for the seed to grow. If the seed does not get these three essentials, the seed will not germinate and will stay dormant until it does so. Although not all seeds look the same, there are two main types of seeds—the dicotyledon and the monocotyledon. So, how are we able to tell the seed type? Once the seed has sprouted, count how my cotyledon the seed sprouts. The cotyledon is the leaf stored within the seed and the first leaves seed sprouts. A dicotyledon has two cotyledons while the monocotyledon has only one. Another way to tell is looking at the veins of the leaves of the plants. If the veins of the plant are parallel to each other, this indicates that the plant is monocotyledon. An example of this is a palm tree. If the leaves have netlike veins, this means that the type is a dicotyledon. An example of this is the maple tree. Looking at the flowers produced can also tell you the seed type. If the flower parts and has petals in multiples of three, the plan is a monocotyledon. If flower parts and has petals in multiple of four or five, the plant is a dicotyledon. Using these indicators, find and draw a monocotyledon and dicotyledon seed, leaf, and flower. Plants share their offspring as seeds with the world. Unlike animals, which can swim, slide, walk and run to new places, baby seeds are sent off by the wind, carried by the water, or carried by animals to new locations. Some seeds make it to a favorable condition at which to they begin to grow and others do not. Dandelions and milkweeds are seeds carried by the wind. Seeds moved by air have tiny hairs, pods that catch the wind, or are light enough and ‘dust-like’ to be blown hither. Fun wind seeds are the Maple ‘samara wings’ that twirl as they fall! Other seeds float on streams and rivers before washing up to soil to grow. Finally, other seeds have barbs or hooks, or bristles to attach to clothing and fur. Seeds travel for miles to new destinations. Seeds like acorns and nuts are good food sources for animals and are often buried, stashed, and forgotten. In this case, the animals help to ‘plant’ seeds! Some seeds are eaten as food, digested and then eliminated far from the parent plant. Often these seeds are coated in droppings, which add nutrients to aid the seed in sprouting! Draw three seeds- one carried by air, one by water and one by animals. Did you know that seeds ‘sleep’? Seeds hibernate or wait, to germinate or sprout. Some seeds wait for the right temperature, oxygen, and water conditions. Others are programmed to sprout through the use of chemicals within nature or by humans. Seed ‘sleeping’ is known as dormancy. Some seeds sleep due to their harder coats; others sleep due to internal chemical dormancy. Predictive dormancy and consequential dormancy are two types of hibernations of seeds. Predictive dormancy is when a seed enters dormancy after a sudden change in the environment, such as a temperature drop, or when sunshine hours lengthen. Consequential dormancy occurs when a seed begins a sleeping period in response to the environment. Seeds then either die or the change makes the seeds stronger and more productive by keeping the seeds active for a longer period. If they germinate and grow, the Cotyledon is an inner layer that stores food for the future plant. The Radicle becomes the first root. The Hypocotyl grows into a stem and the Epicotyl become the first leaves. Draw and label the parts of a seed and what they do or become. People all over the world collect, harvest, and save seeds. The majority of saved seeds are for replanting the following season. There is an art to saving seeds. Another reason for saving seeds is to deposit them in a seed bank. Today there are several seed banks around the world dedicated to preserving plant diversity by archiving seeds. To ensure seeds viability after years and years of storage, the temperature and humidity of the storage area need precise regulation. Preserving seeds under controlled conditions can double or even triple the lifespan of seeds. 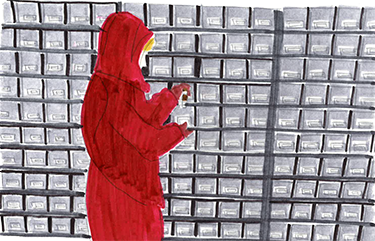 Watch: See inside the Doomsday Seed Bank. Find five of the closest seed banks to you. Growing seeds is not as hard as you may think it is. You just need a starting pot, seeds, soil, and water! For seeds to grow healthily, you have to make sure that you keep in mind the weather and the season. Seeds successfully grow at different times of the year. The temperature, humidity and hours of sunshine for each season determine the planting and growing period for seeds. Now let’s look at what each of these parts becomes once the seed becomes a plant. The Epicotyl are the parts of the seed that become the first leaves of a plant. The Hypocotyl is the stem of the plant. The Cotyledon is the inner protective layer of the seed that stores food for the seed to use during the process of germination and until the seed comes through the soil and has leaves that can be used for photosynthesis. Try growing your own seeds and take pictures of the different stages. How are you able to tell if a seed is a monocotyledon? What are the three most important components needed for a seed to sprout? What can cause a seed to go into dormancy? Why does the temperature and humidity need to be regulated in a seed bank? Video Seed Dispersal The Great Escape!